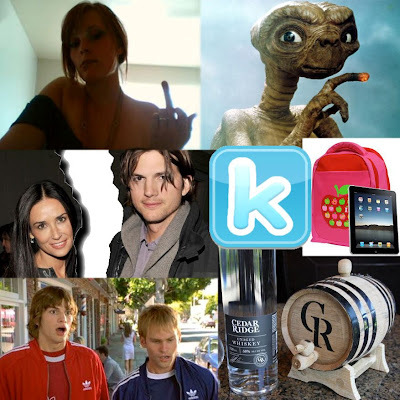 Our first story from 12 months ago was one of many involving celebrity idiot, Ashton Kutcher. The perennial scruffbag had just launched his own version of the giant social media platform, Twitter. Follow the link to discover what he called it. Following on from 'Kutch' was a rather clever post which reviewed the top posts on this site from exactly one year before. Usually first on the list, but for some reason he was slacking, Brad's New CD release dissected Glee, R.E.M., Sinatra, Alvin and the Chipmunks and Seventh Day Slumber. I wish Brad would revive his New CD posts, it was one of the things that made Sundays worth getting up for. i is for Apple is a prophetic poke into the future of technology within the school system. The pros and cons of replacing textbooks with e-readers to lighten the load of the average high-school student. 12 months ago we published one of our more popular product reviews - Cedar Ridge 'Age Your Own Whiskey' kit. We received one of these kits and totally messed it up. Take a look, it was a great day in the office. Remember Mariah Yeater? She accused Justin Bieber of being her 'Baby Daddy', but there was another wrinkle in the story. Mariah's mother may have been getting extra-marital with an extra-terrestrial.